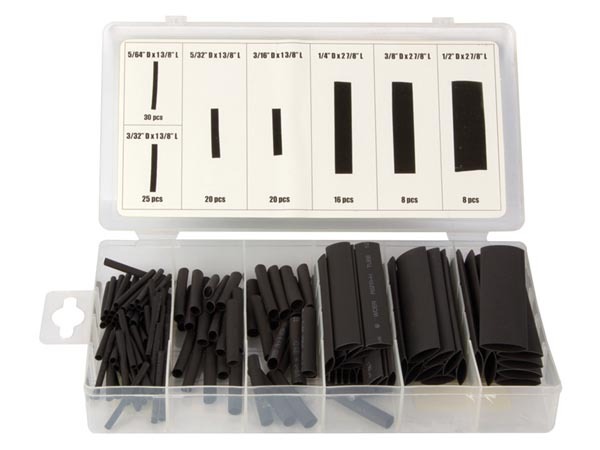 A selection of 127 various coloured pieces of heat shrink tubing. Box contains the following tubing. 30 pieces of 2mmØ, 25 pieces of 2.5mmØ, 20 pieces of 3.5mmØ, 20 pieces of 5mmØ, 16 pieces of 7mmØ, 8 pieces of 10mmØ and 8 pieces of 12mmØ. All pieces are approximately 40 - 80mm in length.